Reflecting on Art gives a chance for the individual to slow down, stop, look and consider. It can evoke discussions, collaboration and a help gain a deep understanding of the context. 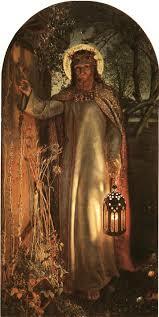 Year 5 used their kowledge about religion to try and interpret the meaning behind this Pre Raphaelite master. The painting held much symbolism and the children observed many key features. Below is some of the writing they produced. Brightly, a star shines in a beautifully clean sky that spreads unbreakable hope. A tall man stands under that sky. He wears a red cloak fastened with a gold piece of jewellery that is elaborately decorated with all sorts of rare gems and diamonds. Also his crown is dazzling but proves a great burden as it has thorns. He bears a great burden of eternal pain for the good of other people. An amazingly pure white cloak is highlighted by a radiant lantern as bright as the sun. He is in a peaceful forest full of crooked trees and animals. The apples of disobedience were created in someone’s world behind the handle-less door. The grass tickles the man’s feet as he has no shoes. A halo blazes around his head while he knocks on the door to that lonely person’s world. The door is overgrown with weeds of stubbornness. But the man does not barge in, he simply knocks. Could he be Jesus entering someone’s world? A gold halo is behind his head. Strangely, all beauty in the world is in that light, it never faded or flickered, not even in the strongest winds. The whole thing is overwhelmingly calming in the radiant light. That never-ending light. A wealthy figure covered in diamonds and gems, stood outside a tall wooden door with a bright lantern in his hand, with his bare feet resting on the soft green grass beneath him. The door was covered in vines, rustling leaves and bushes and you could see the door hadn’t been opened for a long time. Jesus was at the door of our lives. He was looking ahead of him, knocking at the door for one of us to open. The door Jesus was knocking on had no handle but on the other side it had one. He had hope that one of us would open the door. As the lantern glimmers in the darkness, Jesus stands along in a lonely forest. The magical leaves rustle and hustle against the gate and the grass lays still between his toes. The magic comes from the light from the lantern, in contrast to, the darkness from the sky. As the crown tilted to one side, a red gem stood out in the darkness. The crosses stand out in the shade of the forest. The painting has a religious element to it. The cloak surrounds him in the coldness of the apples and the leaves. If Jesus didn’t have the lamp, our world would never be light. During the black of night Jesus stood alone in the swampy plains as the smell of moss filled his nose. A golden halo floated above his head, emitting a dim light. Jesus’ hand touched the rough wooden door. Over the years prickly vines and weeds had crept up the door. It had no handle, but there possibly could be one on the inside. Jesus wore royal robes and a cape, which was covered in gold and various other jewels and gems. A gold crown rested on his head. On the other side of the door could be a family, afraid to let anyone into their lives. Jesus held a candle-lantern which gave a sign of hope. This door was the door of love, life and trust. The gateway to the peaceful garden of Eden. The people behind the door would have to trust Jesus enough to let him in. Jesus spotted a gap underneath the door; he picked up an apple – which symbolises the apple tree of Eden – and rolled it underneath the door.